The Boundary is a debut novel from Queensland lawyer Nicole Watson and tells the story of the aftermath of an unsuccessful native title claim made by the Corrowa people of Brisbane. Hours after handing down his judgment with respect to the claim the Judge who presided over the case is murdered and it’s not long before Police focus on the people involved with the claim as suspects. When another high-profile person connected to the case dies the claimants are even more heavily scrutinized. Action unfolds from several perspectives including that of Miranda Eversley, one of the lawyers who helped fight the six year case, and the two Homicide detectives who must investigate the murders. One of the detectives is Jason Matthews who has largely, and deliberately, ignored his own Aboriginal heritage while his partner, Andrew Higgins, is the son of a disgraced policeman. He can even concede that the law is unfair: in order for their native title claims to succeed, black families must somehow prove that each generation was unscathed by the carnage of the Europeans, an insuperable obstacle for those in the cities. Although I can’t claim any particular insight into many of the individual experiences and histories depicted in this book I have, through work, had a lot to do with the processing of claims under native title legislation and have believed for a long time that, whatever the original intent, its application is appallingly inadequate and bordering on the insulting. It was therefore particularly interesting, though saddening, for me to see this reflected in The Boundary. For all that though the book is first and foremost a story; succeeding in the main in making the narrative rather than the politics the most important part of the book. Chiefly this is because the characters we meet are well drawn, even if many are nearly as confronting as the themes of the book. Miranda struggles with self-loathing and alcoholism, feeling she can’t do enough to live up to the expectations her community and her father, a respected activist and elder. Her battle is a grim one though credibly depicted and it’s not too much of a spoiler to let on there is a welcome sense of hope surrounding Miranda despite all she goes through. The two policemen are memorable for different reasons and one in particular made me squirm. His attitude, even if not his extreme presentation of them, is worryingly familiar. The various politicians and government officials are, again sadly, all too credible; with several bearing a startling resemblance to people I know. Some aspects of the writing in The Boundary are a little clunky, in particular a slight over abundance of similes and metaphors, but other elements suit the story even though they might not be considered strictly kosher in a grammatical sense. The use of short sharp sentences, sometimes without the prepositions one might expect, is done to good effect in helping express frustration and anger. The narrative is a little patchy in parts, there’s one sub-thread that I didn’t think added much to the overall story, but this is a minor criticism of what is an overwhelmingly believable and engaging story which also incorporates traditional storytelling in a compelling and nicely understated way. This is one of those books that should be much more widely read than it undoubtedly will be, and the people who would benefit most from its lessons will never open its covers. Despite this, or perhaps because of it, The Boundary is a fine addition to the growing library of contemporary Australian crime fiction which examines our society intelligently and realistically while telling a ripping yarn. In case there is any doubt, the fact that the book is at times also confrontational and even uncomfortable is not meant as a criticism, just the opposite in fact, but I won’t pretend it wasn’t something of a relief to reach the last page. However necessary it may be it is unsettling to be prompted to honestly examine one’s own behaviour and potentially hidden biases. It’s been a long time since a book did that for me. Nicole Watson is a member of the Birri-Gubba People and the Yugambeh language group. Nicole has a Bachelor of Laws from the Universityof Queenslandand a Master of Laws from the Queensland University of Technology. Nicole was admitted as a solicitor of the Supreme Court of Queensland in 1999. She has worked for Legal Aid Queensland, the National Native Title Tribunal, the Queensland Environmental Protection Agency and as a columnist for the National Indigenous Times. Nicole is currently a senior research fellow at the Jumbunna Indigenous House of Learning, University of Technology, Sydney. This is her first book; published after having won the 2009 David Unaipon Award for a manuscript by an unpublished indigenous writer. The novel won the David Unaipon Award in 2009 which is given to the best manuscript by an unpublished indigenous writer in the annual Queensland Premier’s Literary Awards (the award is named after a very famous Australian Aboriginal man who was an inventor, activist, writer and lecturer and whose image is on the $50 note in our currency). Although Australian crime fiction does have several indigenous protagonists (including Arthur Upfield’s Napoleon Bonaparte and Adrian Hyland’s Emily Tempest) I can’t think of one who was created by an indigenous writer (do let me know via the comments if there are any that I’ve missed) and I am looking forward to seeing how Watson has approached the genre. Nicole Watson is a member of the Birri-Gubba People and the Yugambeh language group. Admitted as a solicitor of the Supreme Court of Queensland in 1999, Nicole has worked for Legal Aid Queensland, the National Native Title Tribunal and the Queensland Environmental Protection Agency. She is currently a senior research fellow at the Jumbunna Indigenous House of Learning, UTS, and is also a columnist with the National Indigenous Times. EVENT: Nicole is appearing at one of the crime fiction events that makes up the Sydney Writer’s Festival Program. Along with PM Newton and Shamini Flint she’ll be talking about detectives who break new ground and don’t fit the stereotypes in a session called The New School on Sunday May 22. 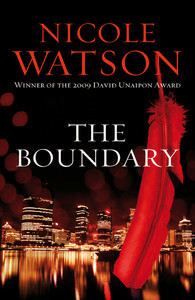 Release date for THE BOUNDARY is officially 30 May 2011 in Australia and the RRP for the book is $24.95. Both of the libraries I belong to have ordered a copy which is encouraging to see, I haven’t yet checked with my local bookshop about whether or not they have ordered copies.